We all have moments of being really happy one second, and then really down the next. We like to call that a mental rut. But how do you get yourself out of that? It is not pleasant being in in a state of all joy and then feeling completely different the next moment. When feeling this way, you need to first admit to yourself that you are in a rut and think positively that you will get out of this feeling. A mental rut is essentially a period of time of when you are feeling negatively about yourself or things around you and you keep spiraling downhill and you need some support in getting yourself back up and thinking positively in the right direction. 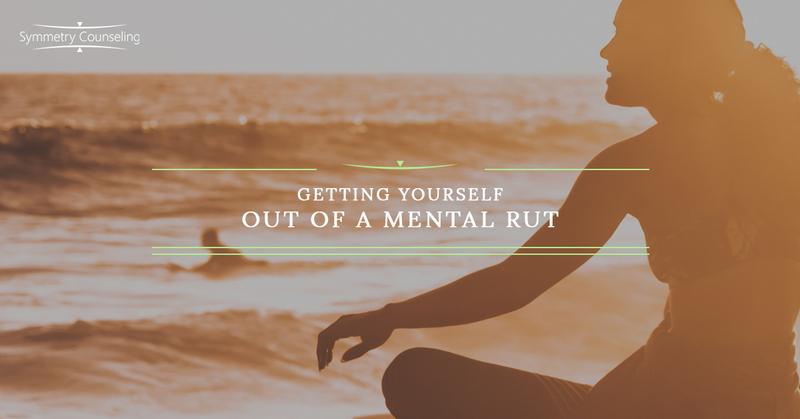 Here are 6 ways to help yourself get out of this mental “rut” that you might find yourself in. When we are feeling not so happy or secure about ourselves, we tend to look at the biggest picture possible and that is sometimes what makes us feel not good about ourselves. When we are setting big goals, they are harder to reach and that brings us down. Setting smaller goals that you know are reachable, will provide happiness and bring you positivity. It will also allow you feel accomplished and achieved. Once you have hit a small goal, you can continue achieving smaller goals to reach your big goal. Meditation and yoga have been around for years, but I feel like recently it has become more prevalent and aware to many people. Meditation and yoga focuses a lot on the breath and deep breathing. When we are forced to focus on our breath, it makes us slow down and recognize that we do not have to rush into everything. We are able to relax and set better intentions for what we have in front of us. Try breathing in (count while doing it), hold it for a few seconds, and then breathe out slowly, while also counting. Try to have the same number for breaths in as out. Many people do not like journaling or even writing in general, but writing down your thoughts can be very helpful. When you right down your negative thoughts with a pen and paper, it allows you to space out your thoughts and not just rush through thoughts. When writing, you are forced to slow down and helps you recognize that sometimes your thoughts are completely irrational. Being able to recognize negative thoughts is key and can allow you to have a more positive outlook on life. When going through a period of being in a mental rut, changing your thoughts into positive ones is not necessarily the things you want to do. Realizing that negativity is a part of life and there are certain things we cannot control, but our thought patterns is something we can control. Changing a “cannot” or “will not” into a “can” or “will” will change your mood. If you have a history of anxiety and/or depression, seek out tools that you need prior to things getting really hard. Have your toolkit of coping skills or supports that you can reach out to. When you are feeling extremely depressed or stricken with high anxiety, it is harder to get out of it. However, if you are able to catch it, then it can be easier to handle. Find someone who will hold you accountable for your thoughts, goals, and homework. When feeling in a rut, your therapist might assign you homework or goals to work towards-tell people about it so they can ask how those goals or homework is going for you. If you feel like you need help to get out of this mental rut, please feel free to contact any of our skilled therapists to help you. Being able to talk to someone about this part of your life is important and can help you identify coping skills and ways to help yourself.